Wipe the surface clean with damp towel. PEVA backing is also easy to wipe clean with wet cloth. Do not machine wash, dry clean or iron. 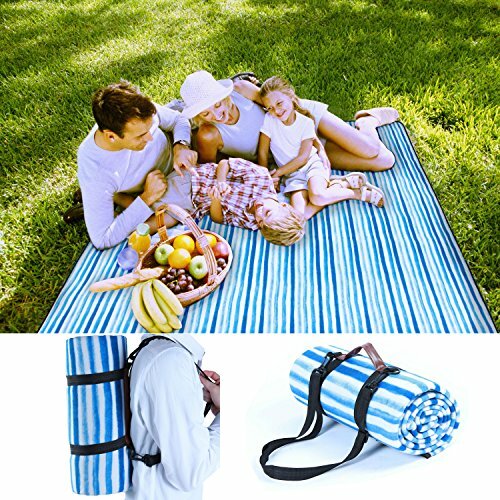 COMFORT & WATERPROOF: This picnic blanket is made of cozy fleece cover, waterproof PEVA backing and 2mm thickness foam, making it not only soft and cozy to sit or lay, but also keeps you away from moisture and sand. LARGE PICNIC BLANKET FOR THE WHOLE FAMILY: This oversized blanket measures a huge 71*59", and provide ample space for 2 person lying down or 5 person sitting, works perfectly for you and your family. Folding tips attached helps you fold the blanket back in minutes. MULTIFUNCTIONAL BLANKET: This folding mat used as a beach blanket, beach mat, camping blanket, RV blanket, emergency blanket or throw blanket, it is the perfect choice for the park, the beach, sporting events, soccer games, tailgates, concerts, hiking and even star-gazing. HANDLE and Shoulder Strap DESIGN: Being folded, this outdoor blanket is lightweight(1.4 lbs) and compact to be carried around by either hand or shoulder. 60 days Money-back satisfaction guarantee. If you have any questions about this product by Pumpkin Town, contact us by completing and submitting the form below. If you are looking for a specif part number, please include it with your message.